This stuff is really good. I found the recipe here. Line an 8x8 pan with foil, with ends of foil extending over the sides. Microwave chocolate and sweetened condensed milk in large microwaveable bowl on MEDIUM for 2-3 minutes or until chocolate is almost melted, stirring after each minute. Stir in chopped cookies. Spread in pan. Refrigerate 2 hours or until firm. 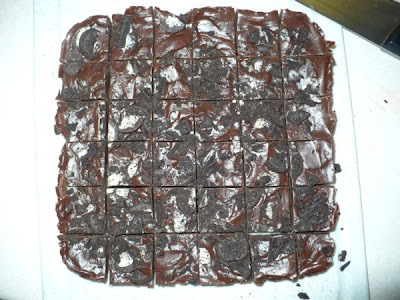 Use foil handles to lift fudge from pan before cutting into 1-inch squares. Store between wax paper in an airtight container at room temperature up to 1 week.